(22005.10, Oklahoma Historical Society Photograph Collection, OHS). Located in northern Seminole County, Seminole is situated ten miles south of Interstate 40 on State Highway 99. The early history of Seminole lies in that of the town of Tidmore. 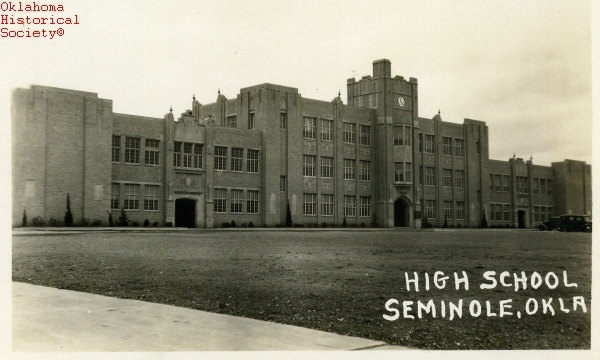 Prior to the founding of Seminole, the Mekasukey Academy for boys (National Register of Historic Places, NR 74001668) was organized in 1893 by the Seminole Nation, and Tidmore was established nearby. When the railroad went north of the town, most of Tidmore's residents moved to Seminole, which was platted in 1906. The post office was established February 6, 1907. For two decades Seminole remained essentially a village and trade center serving a surrounding agricultural region. At 1907 statehood the community had 206 residents and by 1910, 476. Newspapers included the County News, County Capital, and Morning News. When Fixico Number One, a discovery well for the Greater Seminole Oil Field, sent up a six-thousand-barrel gusher in 1926, Seminole transformed from a sleepy town of 854 to a boomtown of 25,000 to 30,000, a population it maintained throughout the mid-1920s. The city became, famously, a morass of mud, as cars, trucks, and heavy equipment rapidly outpaced the ability of the town to provide stable streets. Railway business in and out of the town soon was the third highest in the nation. Shacks and tents sprang up everywhere. By the mid-1930s the boom was over. The population declined and held steady at around 11,000 from 1930 to 1970. Oil continued to be an important part of the economy, as evidenced by the annual celebration of Gusher Days in the early summer. However, Wrangler Jeans and Seminole State College played a larger part in the economy. The W. E. Grisso Mansion (NR 75001573) built during the oil boom, the Seminole Historical and Oil Museum, and the Jasmine Moran Children's Museum remained attractions. At the turn of the twenty-first century Seminole had 6,899 residents. They were served by the Seminole Producer newspaper and a municipal airport. The town maintains a council-city manager form of government. In 2010 the population was 7,488. Louise Welsh, Willa Mae Townes, and John W. Morris, A History of the Greater Seminole Oil Field (Oklahoma City: Oklahoma Heritage Association, 1981). Elsie Morris, "Seminole (town)," The Encyclopedia of Oklahoma History and Culture, https://www.okhistory.org/publications/enc/entry.php?entry=SE012.